Hero Xtreme 200R gets premium features; 200cc air-cooled engine planted inside. The Xtreme 200R price will be disclosed in the month of April 2018. 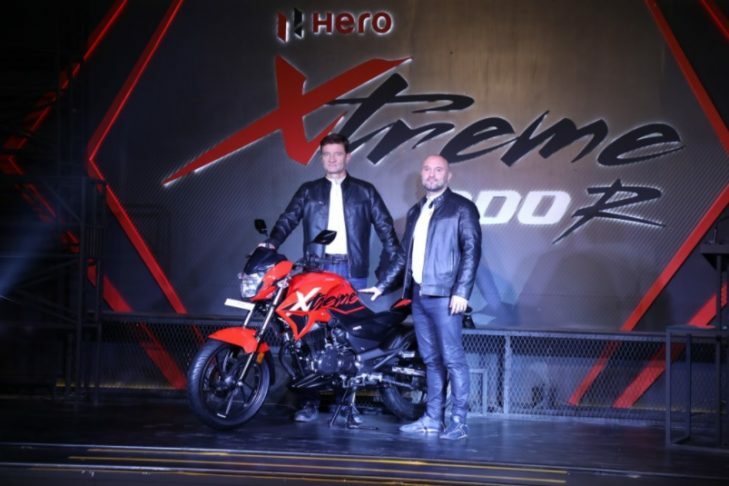 Hero MotoCorp Ltd., the world’s largest two-wheeler maker, unveiled the all-new Xtreme 200R motorcycle on 30th January, a week ahead of the Indian Auto Expo 2018. With Hero Xtreme 200R, the company plans to strengthen its presence in the rapidly growing premium motorbike segment. The Xtreme 200R is a higher engine capacity bike and the company will launch it in India in the month of April 2018; prices will be disclosed during the launch. However, the bookings are expected to start very soon. The Xtreme 200R is a performance oriented motorcycle that comes with many premium features and is bestowed with a Roadster styling. The body of the bike is quite muscular and aggressive, and the design is way beyond the standard commuter bikes that Hero currently sells in the country. Hero hasn’t left any stone unturned to make it one of the most appealing motorbikes in the segment. The bike is undoubtedly a head-turner sketched with plenty of muscular impressions throughout the profile and aggressive styling. What makes the Hero Xtreme 200R more striking and distinct are some exciting features like Sporty Headlight, Eyebrow-shaped LED Pilot Lamps, Bold Fuel Tank, LED Tail Lamp with Guide Lights, Sporty Digital Analogue Cluster and Dual Tone Body Colour. For improved ergonomics and seating comfort, the Hero Xtreme 200R gets a newly designed contoured seat. The bike is powered by a BS-IV 200cc air-cooled engine that returns maximum power of 18.4 PS at 8000 rpm and maximum torque of 17.1 NM at 6500 rpm. Moreover, the speedometer clocks 0-60 km/h in just 4.6 seconds and the top speed of Hero Xtreme 200R is read 114 km/h. Hero has blessed the Xtreme 200R’s engine with additional balancers that will ensure smooth power delivery by cutting first order vibrations. The Xtreme 200R is smartly introduced with a tough yet lightweight frame that will offer its riders precise handling in tight corners along with great stability at high speeds. Added to this, for the perfect balance of agility and comfort, the Xtreme 200R is offered with Ergonomic-riding triangle between the handlebar, seat and foot-pegs. The Xtreme will be offered in five exciting dual-tone colour schemes – Panther Black with Red, Panther Black with cool Silver, Charcoal Grey with Orange, Sports Red and Techno Blue. Safety isn’t compromised either as the Xtreme 200 gets safety features such as 276mm front disc and 220mm rear disc brakes along with optional ABS. Precise control is ensured by the 37mm broad front fork and, superior handling and cornering is further provided by 7-step adjustable mono-shock suspension technology. The wheels are fitted with 130/70-17 inches rear radial tyre that offers superior road grip, top-notch cornering and efficient braking under all conditions. This performance driven bike is designed and developed by the company’s in-house Research & Development team, at the Hero Centre of Innovation and Technology in Jaipur. The officials during the unveiling stated that they will also be launching many impressive products later this year, many of which will be showcased at Hero MotoCorp’s pavilion at the Auto Expo 2018. With the Xtreme 200R, Hero seems to be ambitious enough to expand its presence in the premium motorcycle segment.